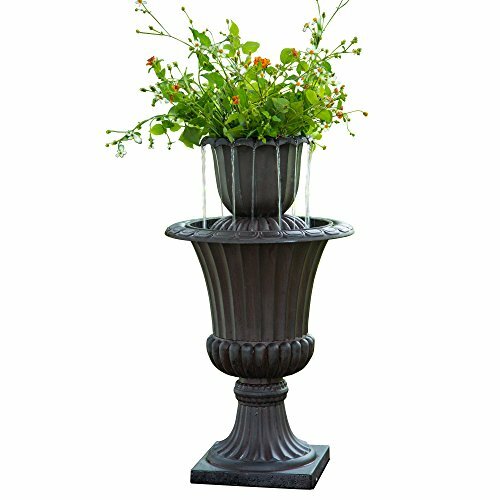 Peaktop - Outdoor 28.35" Urn Flower Pot Water Fountain | Fountain City Art Ctr. Bring the intrique modern feel of the Urn Flower Pot Fountain to spruce up your garden today. Beautiful fountain brings a calm and cooling effect to any home. Product dimension: 16.14" (L) x 16.14" (W) x 28.35" (H). "Made out of polyresin. Both for indoor/ outdoor use." Estimated assembly time: 5 mins. Packaged with step-by-step assembly instruction. If you have any questions about this product by Peaktop, contact us by completing and submitting the form below. If you are looking for a specif part number, please include it with your message.